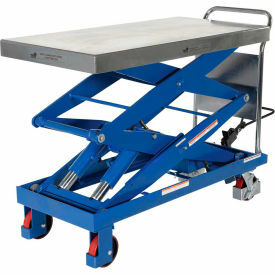 Material can be easily loaded onto this portable lift from a table or bench, lowered to a height for safe transporting, and raised at the destination for easy unloading. Mobile Lift Table features foot pump elevating and hand-controlled lowering that includes a soft-lowering down valve with an internal hydraulic velocity fuse for smooth operation. Moves easily on polyurethane casters, two swivel with brakes and two rigid. Durable steel construction.